Millions of people suffer from incontinence and urine wetting problems. Both young and old commonly experience incontinence episodes that need to be detected early to help with their care and hygiene. Adult incontinence is a common issue and nothing to be ashamed of, and there are a variety of solutions out there to help you manage or overcome your bedwetting and incontinence issues. 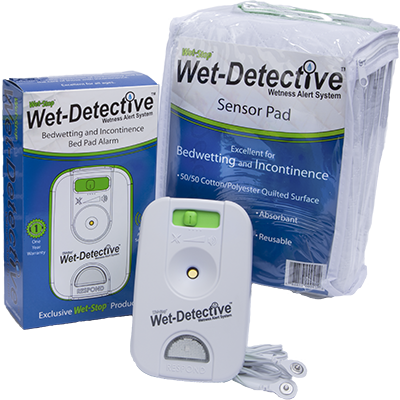 The Wet-Detective alarm and patented bed pad system can be used in incontinence management and care. Simply place the waterproof and washable pad under the person and on top of a bed or chair. Once the incontinence pad is wet a silent light, soft beep or alarm notifies caregivers that the pad is wet and care is needed. The Wet-Detective allows a person with incontinence problems to wear their normal clothes and avoid diapers. The Wet-detective also helps care providers know when care is needed. This leads to improved sanitary conditions for those suffering from incontinence, preventing disease and other health-related problems that can be caused by lying or sitting on a wet pad for extended periods of time. Visit the National Association of Continence for more information.